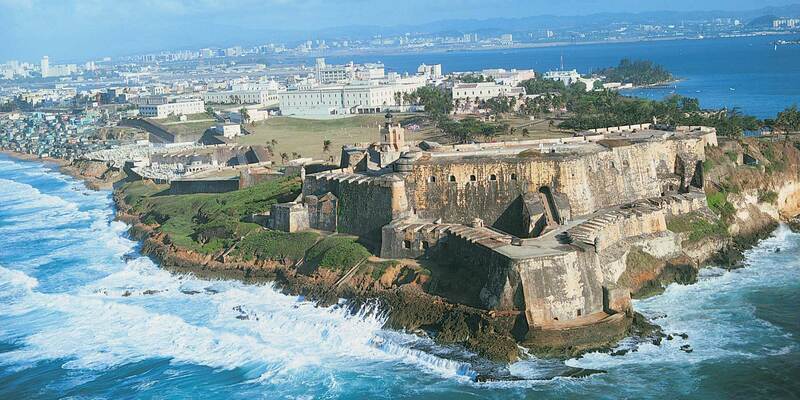 From the modern "Museo de Arte de Ponce" to the historic and world-famous "Castillo San Felipe del Morro", listed below are Puerto Rico's most visited tourist attractions. Many of these are free to enter and are great places to visit and enjoy. El Morro was initially fortified in 1539 and completed in 1589. Rising 140 feet above the sea, its 18-foot-thick wall proved a formidable defense. It fell only once, in 1538, to a land assault by the Earl of Cumberland's forces. The fort is a maze of tunnels, dungeons, barracks, outposts and ramps. Many restorations and expansions contributed to the imposing structure it is today. The area was designated a National Historic Site in February 1949 with 74 total acres. Tours, orientation, and video presentation are available in English and Spanish. Open daily 9am-5pm. Free admission. While visiting El Morro, I have few more suggestions on how to spend a day in Old San Juan. 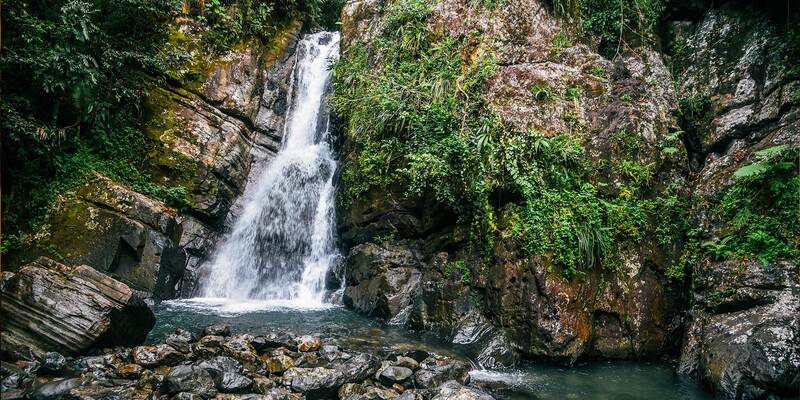 El Yunque National Forest with a total area is 28,000 acres has an estimated 240 types of tree, and many other plants, such as tiny wild orchids, bamboo trees, giant ferns, and trumpet trees. Hiking trails and rest areas are available. El Portal Tropical Forest Center has film exhibits and interactive displays about the rain forest. Open daily 7:30am a 6:00pm. 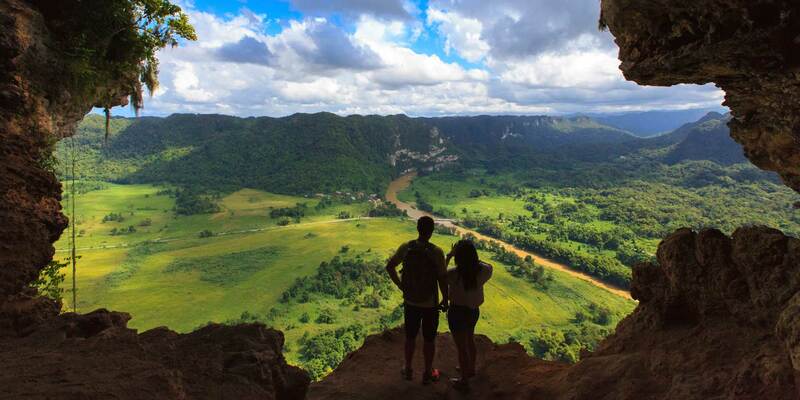 This incredible 268-acre park is the site of the great subterranean caverns carved out by the Camuy River over one million years ago. The park is one of the largest underground formations in the Western Hemisphere, and only seven miles (11km) of this series of limestone caves have been fully explored. The impeccably maintained trails gently descend 200 feet through a fern filled ravine to the yawning, cathedral-like caverns. The park is one of the world's largest cave networks. Sixteen entranced have been found and 11 kilometers (7 miles) of passages explored so far. Tours available, visitors are guided through one cave and two sinkholes, there are fine examples of stalactites, stalagmites and, of course, plenty of bats. The park is equipped with picnic areas, walking trails, food facilities, and exhibition hall and a souvenir shop, making it the perfect place to spend a day. Southwest of San Juan, about a two-hour drive. Open Wednesday-Sunday 8am - 4pm; admission US$10 adults and US$7 children. This is a 465-year-old neighborhood originally conceived as a military stronghold. Its 7-square-block area has evolved into a charming residential and commercial district. The streets here are paved with cobbles of adoquine, a blue stone cast from furnace slag; they were brought over a ballast on Spanish ships and time and moisture have lent them their characteristic color. The city includes more than 400 carefully restored 16th- and 17th-century Spanish colonial buildings. The Old San Juan attracts many tourists, who also enjoy the gambling casinos, fine beaches, and tropical climate. To really do justice to these wonderful old sites, you'll need two mornings or a full day. "Flaming June" by Frederic Lord Leighton, on display at the Museo de Arte de Ponce, Puerto Rico. The Ponce Museum of Art holds works by Puerto Rican and other Latin American artists. It has one of the most important pre-Raphaelite collections in the Western Hemisphere, which include pieces by a respectable representation of European artists, like Van Dyck, Reubens, Rodin, Delacroix and Gainsborough. The building, was designed by Edward Durell Stone (Museum of Modern Art, NY). Open daily 10am-5pm. Admission: Adults $3, children $2. This rare and remarkable phenomenon is caused by millions of luminescent dinoflagellates lighting up when disturbed by movement. The dinoflagellates, a tiny form of marine life, have characteristics of both plants and animals, their size range from about 5 to 2,000 micrometers (0.0002 to 0.08 inch). Trips leave every night from the bar at Casa Del Frances (Island Adventures, Inc., 787-741-0717 or 787-741-3751). Located on route 648 on the north coast of Puerto Rico, Mar Chiquita (Little Sea) offers one of the most spectacular seaside scenery on the island. It is unique, not your typical coast beach by any means. Two coral formations protect a small and shallow cove from the rough Atlantic Sea, which sprays foam in unpredictable bursts. Culebras most popular beach is Flamenco Beach, because of its white and soft sands. Camping is available at Flamenco Beach on the north shore. 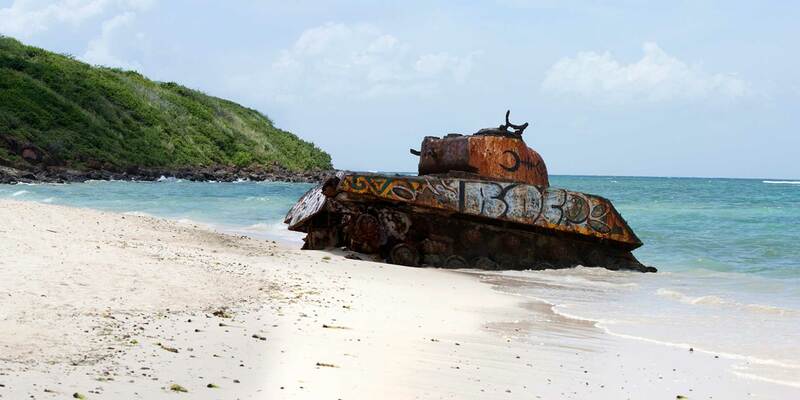 Culebra Campgrounds are government-run, for reservations contact: Autoridad de Conservación y Desarrollo de Culebra, Attn: Playa Flamenco, Apartado 217, Culebra, PR 00775. This is an astronomical observatory located 16 km (10 mi) south of Arecibo. This is one of the world's most powerful radar-radio telescopes, and the largest single-unit radio telescope in the world. The main collecting dish is 1,000 ft (305 m) in diameter was constructed inside the depression left by a karst sinkhole is the largest curved focusing dish on Earth, and covers an area of 18 acres. The antenna can be moved in any direction, making it possible to track a celestial object in different regions of the sky. It collects radio astronomy, terrestrial aeronomy, and planetary radar data for scientists around the world. 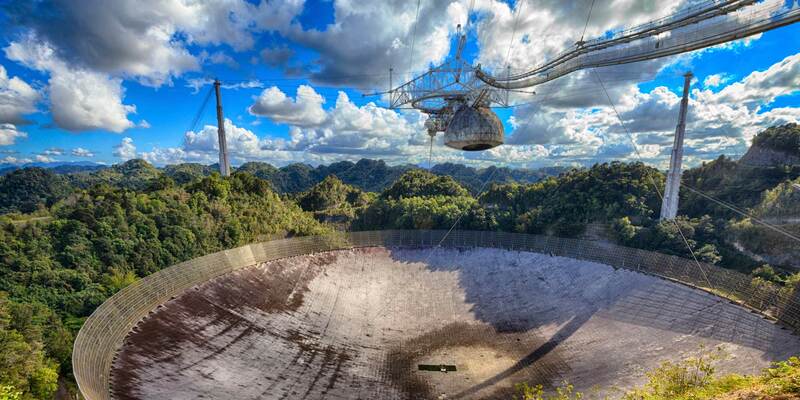 The Arecibo Observatory is a part of the National Astronomy and Ionosphere Center (NACI) and is operated by Cornell under a cooperative agreement with the National Science Foundation (NSF). Conceived in 1958 by William E. Gordon, a Cornell professor of electrical engineering, the radio observatory has been operated, since its completion in 1963. The telescope was featured in an episode of The X-Files, and the movies GoldenEye (1995) and Contact (1997). The facilities are open to the public Wednesday-Friday noon-4 p.m., Saturday and Sunday 9am - 4pm. Route 625, Bo. Esperanza, 787-878-2612. 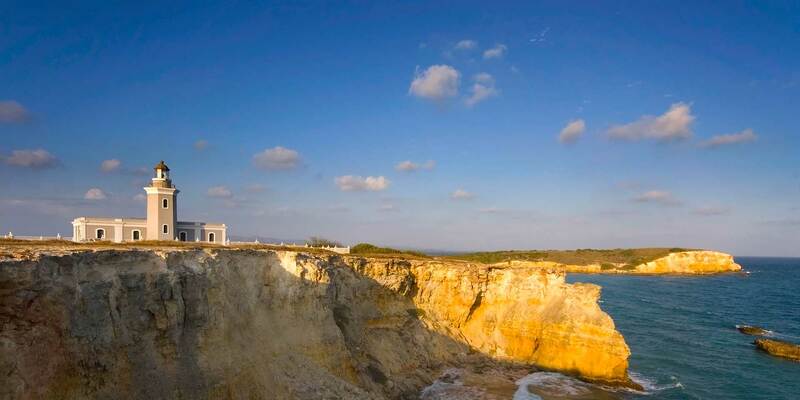 The Cabo Rojo Lighthouse is located on Route 301, on top of 200-foot limestone cliffs overlooking the Caribbean Sea, offering spectacular and 360 breath taking views of the Caribbean Sea. Los Morrillos Lighthouse (Faro Los Morrillos de Cabo Rojo), also known by locals simply as "El Faro" was the second lighthouse built by the Spanish in Puerto Rico, construction began in 1881 and completed 1882. Since then it has been serving as a guide to ships navigating the southeast entrance from the Caribbean Sea, safely through the Mona Passage into the Atlantic Ocean. This old lighthouse was automated and electrically charged in 1967. The lighthouse is open to the public. Admission to the lighthouse is free. Open Thursday-Tuesday (closed Wednesday) from 9:00am to 4:30pm. 787-255-1560. See more attractions, listed by city.